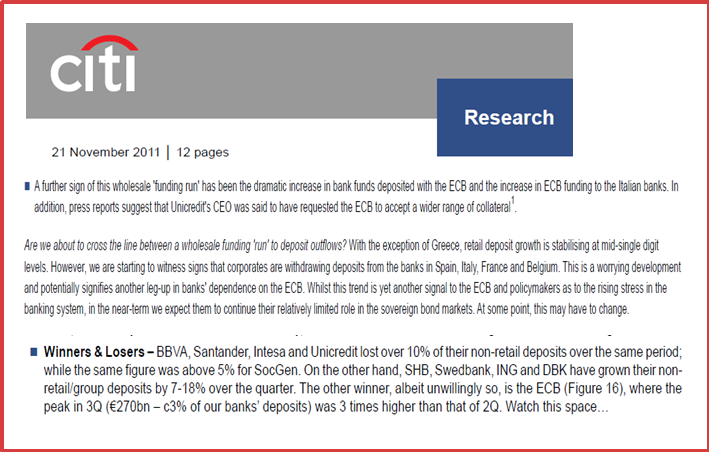 This week we got what seemed to be some good news in the ongoing Euro debt crisis. 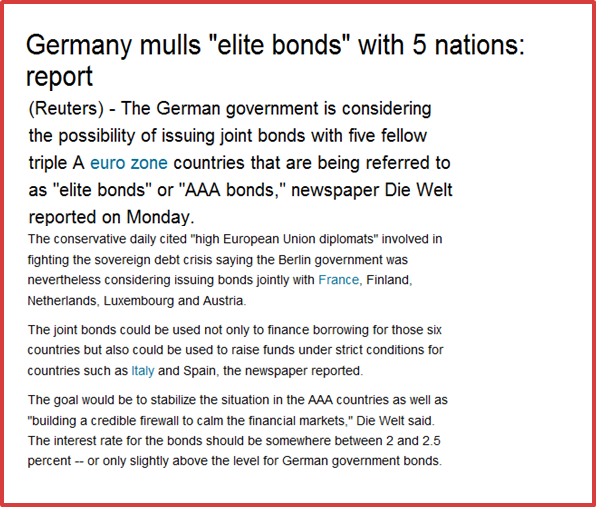 Bond spreads in many of the countries on Europe's periphery tightened vis-their German equivalents. Unfortunately we also got some bad news to go with it (no silver lining these days without the accompanying black cloud it seems): the tighter spreads were the result of a weakening of German bunds (or a rise in their yields) following what many considered to be a failed bond auction. 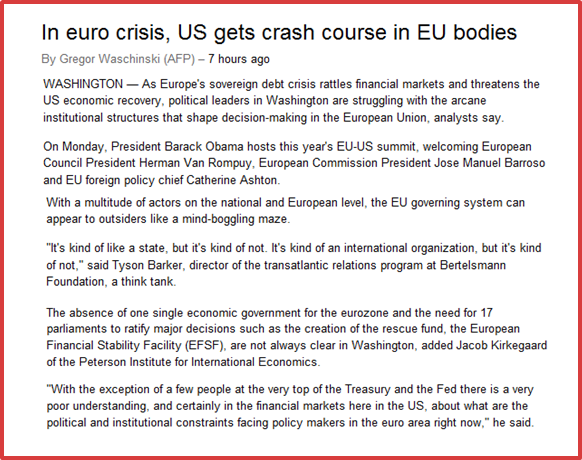 What is becoming clearer to almost everyone is that this is now no longer simply a Euro periphery sovereign debt crisis. 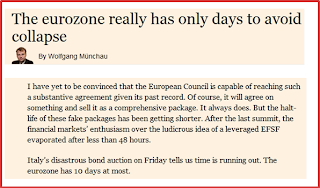 It has become a full blown crisis of confidence in the Euro itself. But just in case anyone was in any doubt, this week Deutsche Bank Chief Economist Thomas Mayer said as much on Bloomberg TV. Naturally he is far from the first to make this point - Commission President José Barroso and European Council President Herman Von Rompuy have been stressing the point for some time now - but it is an interesting reflection of how widely this opinion is now spreading. One of the reasons for the recent rise in tone and in the level of concern is that it is clear contagion is now spreading far from the periphery. 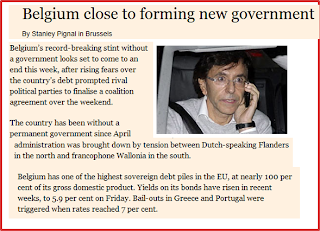 Belgium and French bonds have come under increasing presssure. And, of course, that famous German bond auction seems to suggest that even German yields are not immune to contamination. Actually, one unsuccesful German bond auction doesn't make a season of them, and Germany is well able to finance itself, but obviously markets are now drawing the conclusion that if Germany isn't willing or able to cut loose from the sinking economies on the periphery, then the German economy will eventually be dragged down with them, which means that German bunds are no longer seen as a surrogate Deutsche Mark, but rather as the backstop for all the unfunded periphery losses which might show up on the EU desk. The frontier between core and periphery is becoming increasingly blurred, with Belgian borrowing costs hitting a Euro era high of 5.8% last Friday. Of course, this weekend there has been a huge rush to agree a budget and put together a government, but after seven months of dawdling as if the large sovereign debt the country is labouring under wasn't a problem all these last minute efforts somehow fail to convince. Really it is the whole European model of nation states and national identities which lie behind the common currency that often lie at the heart of the problem. If countries like Belgium lack a national consensus, while others like Italy and Spain have minorities (who pay more than there numerical share) who are not really convinced they want to be in the country, then how can a fiscal union which would be based on some countries permanently paying (the so called transfer union) while others continually receive hope to hold itself together politically? Then the possibility of joint and several responsibilities between an ever diminishing number of "core" core countries is simply leading to impossible pressures on the sovereign debt of the countries concerned. We have seen the first jitters in the direction of German debt this week, but France is a much clearer example as the exposure of the French banking system to Italy (400 billion euros worth, including public and private sector debt, according to BIS data) is leading to impossible pressure accumulating over the French rating, something which makes activating the EFSF as initially intended look increasingly difficult. And contagion from the crisis is now heading East. 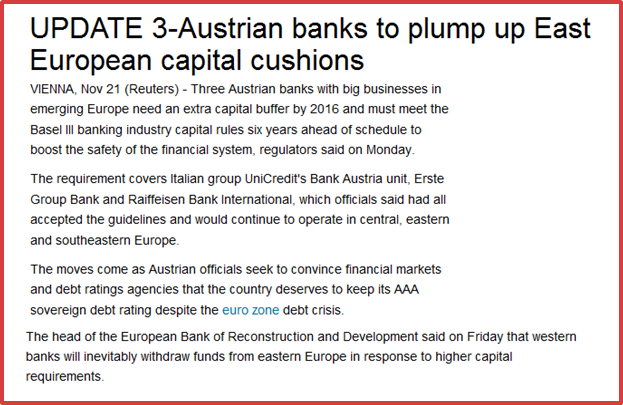 Austria is worried about its triple A, and is imposing new restriction on CEE funding by Austrian Banks. 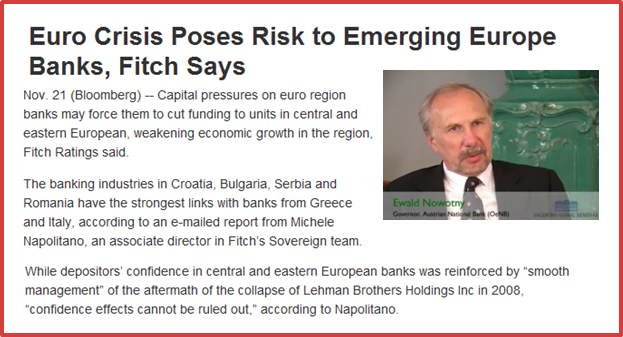 Naturally, as Fitch suggest, this is likely to extend the credit crunch out to the East. Hungary is the obvious "missing link" here. 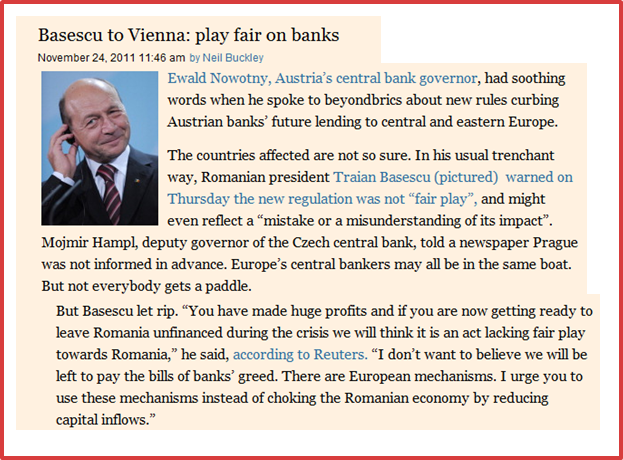 But Romania is evidently not far behind, and President Traian Basescu is definitely not amused. Of course the problem is not just a European one. 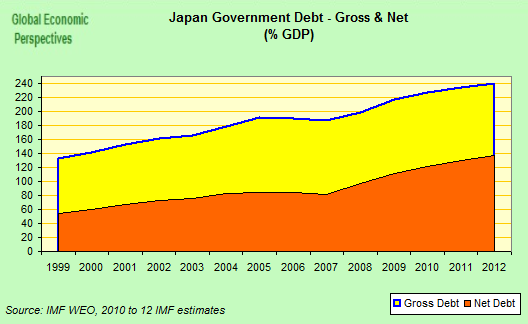 Japan has a massive sovereign debt problem too. In fact, far from having the "V shaped" recovery from the Tsunami some (not me) were predicting the short term outlook for the economy seems pretty dire. Policymakers in Japan still attempt to pin the problems down to confidence issues stemming from the Euro debt crisis and the high value of the yen, but surely what has been happening in Japan over the last 20 years has something more than local interest, since it was a harbinger of things to come elsewhere. In the first place there is the problem of debt (whether public or private). 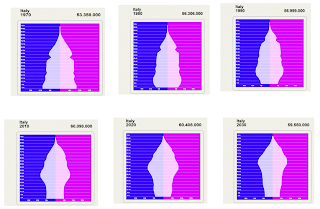 Secondly there is the problem of population ageing. 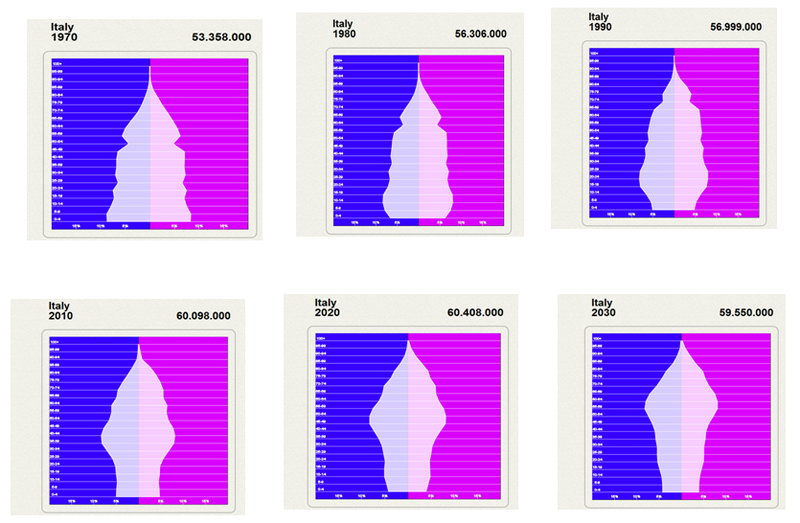 The figures below show the transformation in Italy's population pyramid between 1970 and 2030. In many ways Italy's demography was at the most favourable point for economic growth (supply side) around 1990 (third figure top row) since the proportion of the total population in the working age group was at near its maximum, and the median age of the workforce was still relatively low. The point to get is that it isn't simply the level of debt that is the problem, it is the level of debt in the context of the implicit liabilities (in terms of health and pensions) which such population ageing represents, and the reduced growth outlook that having declining and ageing populations represents. Europe's leaders are essentially in denial on the extent of this problem, and are putting all their eggs in the "structural reforms to raise trend growth" basket. The third factor which has decisively changed things to the disadvantage of the ageing and endebted developed economies has been the rise of the new emerging economies. This has changed the perception of risk, against developed economies and in favour of emerging ones. 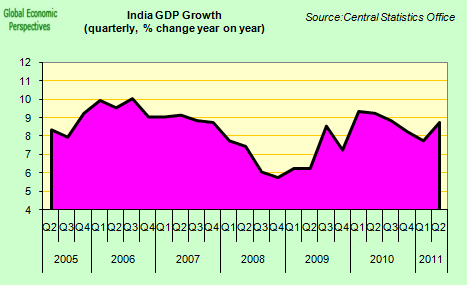 It is unlikely that this trend will be reversed. 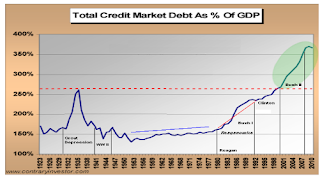 So we have economies with excessive debt plus implicit liabilities who are going to be challenged to sustain growth rates similar in magnitude to those we have observed in the recent past, and it is this which makes the level of accumulated debt unustainable and which makes it possible to speak of a developed world generalised debt crisis. But, despite this, those countries in the Euro area have a special problem. The common currency was created with a deficient institutional structure, which creates confusion over who is responsible for what. Viewed from outside the EU it almost seems as if you need a PhD in European studies to follow what is going on. In an era where the best policy if you have a financial product to take to market is "keep it simple" this hardly would seem to be a good idea. Cutting through all the foam and wrapping here, the key question is who is going to sign the cheques and who is going to pay? José Barroso and Herman Van Rompuy may make very nice photo images in Washington, but what exactly does there bank balance look like? So the key question market participants want to know, as President Barack Obama asked in Canberra recently, is who (or what) really stands behind the Euro. The answer so far has simply been a deafening silence. So what are the institutional solutions that are being toyed around with? The basic point to get is that this is all about money, who is to provide it, and who will take any losses there may be in the longer term. Basically there are three lines of attack on the table. In fact the solution Europe's leaders are likely to come up with involves some variant of all of these. As I suggested in my last piece, the ECB is desparate to go so far and no further. This is understandable given that no central bank likes the idea of finding itself having to show losses. 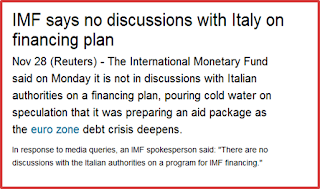 Just how far the bank is prepared to go in order to avoid this is made plain from the rumour circulating this weekend that the IMF was readying up 600 billion Euros to lend to Italy. Just where the IMF was going to find the money was not explained by most of the sources, but thanks to a speedy translation from Edward Harrison at Credit Writedowns, we discover that it was another one of those cockamany schemes whereby the ECB would actually lend the money, but the IMF would guarantee all the risk. Which simply begs the question; is there no one in Europe willing and able to guarantee the risk? And if not, why not? A stunning silence from Berlin. Under the circumstances it is hardly suprising that the IMF rapidly denied the report. It looks to me like someone, somewhere (someone with responsibilities for funding the IMF perhaps?) put their foot down, and firmly. 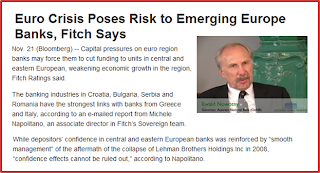 Nonetheless it is quite likely that the ECB would be involved in some way, shape or form in any final attempt to rescue the Euro, possibly via some kind of security markets programme, and keeping the banking system supplied with liquidity. Which brings us to the EFSF, and here we do have some news. According to a report from Reuters, the documentation is all ready and prepared for the EU Finance Ministers meeting tomorrow on formulas for leveraging the EFSF. The formula being used for leveraging makes the current proposal look very similar to original Alianz Insurance proposal. The documents seen by Reuters specify that the EFSF could offer partial protection to investors buying a country's bonds at a primary auction of around 20-30 percent of the principal amount of the bond, depending on market circumstances.The protection certificate would be detachable from the bond and could be traded separately, but the investor would have to hold bonds of the country before cashing it in. The certificate could be paid if the bond issuer triggers a credit event under the full definition of the International Swaps and Derivatives Association, but, of course, in the wake of the Greek private sector involvement swap investors are now nervous that any future restructuring of Eurozone bonds might be carried out in such a way as to not trigger an ISDA event, so it is not really clear how valuable this insurance actually is, or how it will be perceived by investors. 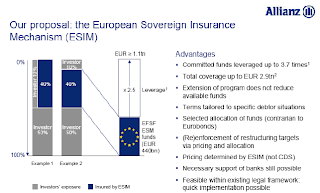 But this isn't the sum total of the problems faced by the EFSF approach, since according to CEO Klaus Regling, the original levaraging objective is now no longer attainable, due to the loss of market confidence. 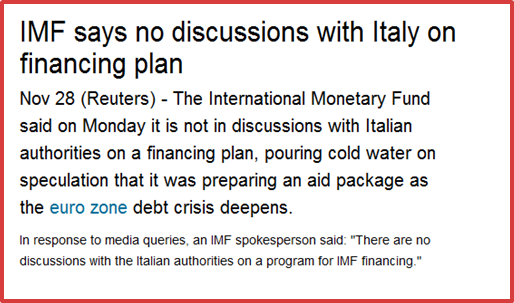 And with Italy alone rumoured to be looking for something like 600 billion Euros, the doable quantities from the EFSF now fall far short of what will be needed. Which brings us back to Eurobonds, which must be the last ditch recourse of someone or other. Markets certainly pricked up their ears last week when Angela Merkel issued those famous "now for now" words, but since that time we have simply had confusion. 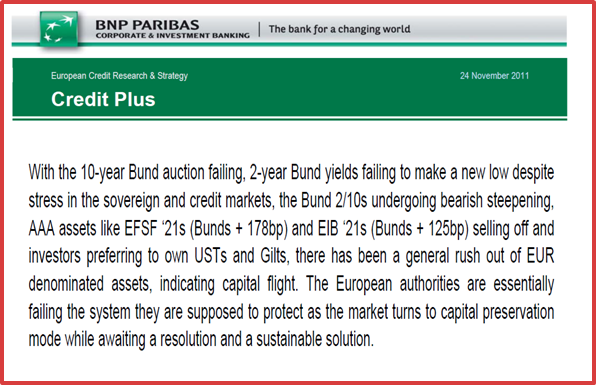 Actually the latest proposal on the bonds have come from the commission rather than the Paris-Berlin axis. 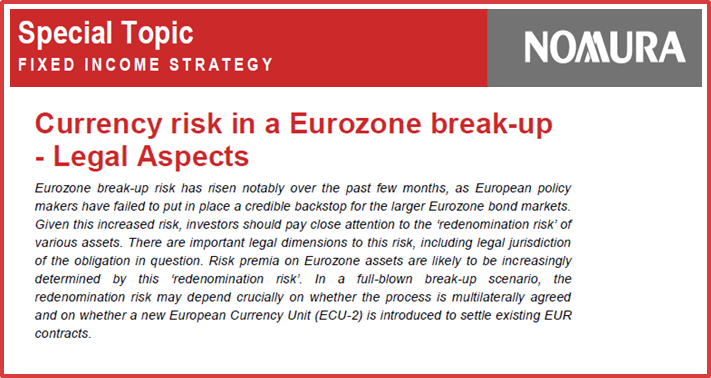 Most observers have reached the conclusion that such bonds will at some point form part of Eurozone policy, but how, and when? The problem is that Angela Merkel is widely perceived as holding back in order to put pressure on recalcitrant periphery governments to bring their deficits into line. 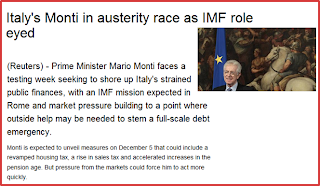 But you can only take brinksmanship so far before you risk having things blow up in your face, a point which is very well illustrated by the dilemmas facing Mario Monti's new government. The problem is the timescale of debt reduction is one thing, and that of market confidence another. Germany is insisting that any advance towards Eurobonds is dependent on moves to what Angela Merkel calls a fiscal union. But by this she doesn't mean the type of common treasury they have in the US, where stronger states help the weaker ones, what she means is common fiscal discipline, with powers from the centre to enforce. The only thing that can be said with any certainty about this situation is that it is very confused. One leaked proposal follows after another, while representatives of the EU Commission in Brussels can barely conceal their frustration with the "go it alone" approach being promoted in Paris and Berlin. 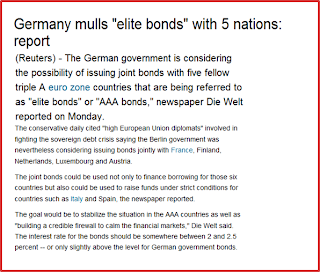 Matters reached a head today with an article in the German newspaper Die Welt (allegedly based on a leak) asserting that Germany was preparing to issue "top tier" Eurobonds with a select group of other triple A countries. This could be read as a first step to a two tier Euro, which would at least be a step towards something. But it is too early to answer the question of whether it is, or whether it isn't. In the meantime market participants are walking with their feet. 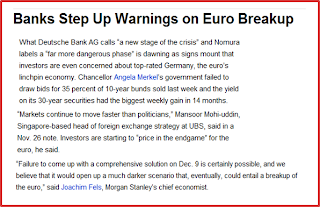 Both banks and ratings agencies are sounding their loudest warnings yet that the euro area risks unraveling unless those responsible for decision taking intensify their efforts to stop the rot. 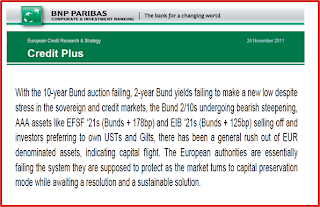 Just this morning I got a research report from Mehernosh Engineerand Gregory Venizelos of the PNB Paribas European Credit Research team.in which they argue that capital flight is already effectively taking place. On the other hand Citi's European Research Team are on "deposit watch", and claim to see signs of deposit outflows from periphery to "core", not retail deposits but corporate ones. and giving advice to clients on the legal ins and outs of asset redenomination. Closing time in the gardens of the west anyone? 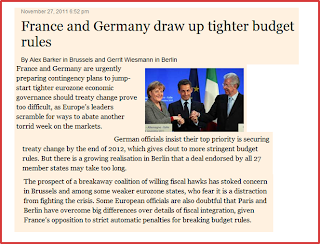 In this environment, it is hardly surprising that Wolfgang Munchau was his usual cheerful self in the FT this morning. While perennial optimist Paul Krugman puts the situation really quite succinctly on his blog. Incidentally, if you can't read any of the inserts, try clicking over them to get a magnified version. Well, it's been more time than I care to remember since I posted anything on this site. In the interim many things have happened, especially on the European sovereign debt front. 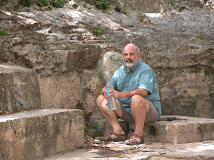 I think I now have plenty of stuff lined up to waffle about, but maybe one simple way to ease myself back in to the world of blogging would be to republish the lengthy interview I just gave to the website Barcelona International Network. The topics covered range from the debt crisis itself, to prospects for Spain under the new Partido Popular government of Mariano Rajoy, and to the kinds of tensions with might arise in the months and years to come between Catalonia and the rest of Spain, and, of course, how this relationship might itself in turn have an impact on the debt crisis itself. 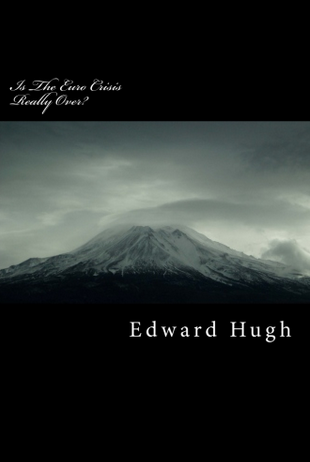 Edward Hugh: You are right. The situation is far from clear. To understand what is happening now it is important to understand the evolution of this crisis from the beginning. Europe's monetary union was founded on the idea that with time the various economies which make up the Euro Area would ultimately converge towards one common prototype. This unfortunately has not happened, indeed what we saw during the first decade of this century was quite the contrary: the divergence of the constituent economies. Thus, while it is common to talk of "core" and "periphery" it is important to understand that the so called core economies are not identical, while those on the periphery do not all suffer from the same ailment. In Greece the problem has been excessive (and indeed almost fraudulent) deficit spending. 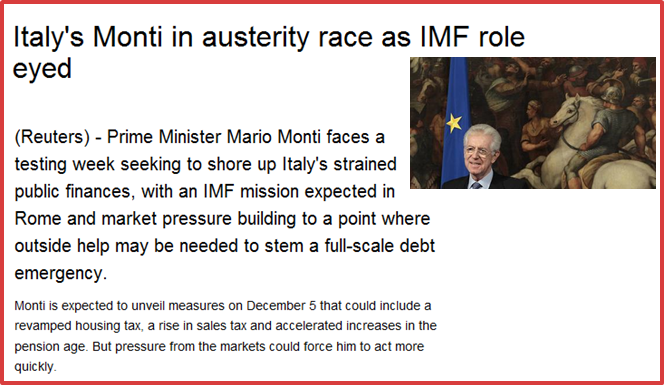 In Italy the problem is accumulated government debt - debt which has been amassed during two decades now. In Spain and Ireland the problem is the bursting of a housing bubble, a bubble which was made possible by the application of an excessively loose monetary policy by the ECB. In Portugal the problem has been one of very low economic growth. etc, etc. So if there is not one common illness it is hard to apply one common cure. In many ways it is unfortunate that the Greek crisis was the first one to break out, since this has reinforced earlier stereotypes that the problem with the Euro is the lack of sufficiently strong fiscal controls from the centre. This is surely the case, but it is only part of the problem, and far too much of Europe's leaders time and energy has been devoted to this issue, to the neglect of many others which in many ways have equal or even greater importance. 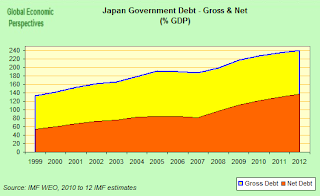 What is true is that lying at the heart of the present crisis (across developed countries, that is including Japan, the UK, the US etc) is the issue of debt, whether this be public sector debt or private debt. That is why what we have is called a sovereign debt crisis. In addition, another of the characteristic features that make this crisis historically unique is that it is occurring in the midst of an unprecedented process of population ageing in economically developed societies, with rapidly rising elderly dependency ratios - hence the importance given to the sustainability of health and pension spending into the future. It is not only accumulated debt that worries investors, but implicit liabilities, and how these are going to be met. Thus the crisis of the Euro Area is only the most extreme form of a debt crisis which engulfs almost all developed societies. 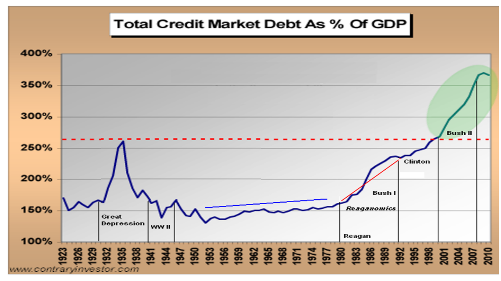 And the situation is only further exacerbated by the fact that the deleveraging of debt which is now required (and hence the likely low growth levels) have as a backdrop a surge in growth in many emerging economies which makes these an attractive candidate for investment from those who worry about the sustainability of debt in the mature economies. So the relative risk evaluation between developed and emerging economies is changing, and this process is unlikely to go into reverse gear. Developed society debt is unlikely to ever be so cheap to finance and so easy to sell as it was during the first decade of this century. Edward Hugh: As I have suggested, the Euro Area crisis is similar to that in other developed countries, but worse due to the institutional deficits with which the monetary union was created. In particular attention has focused on two areas, the role of the central bank (the ECB) and the lack of a common fiscal treasury. To some extent these deficiencies are now being remedied, but the pace of adaptation is slow, and the financial markets are starting to lose patience. 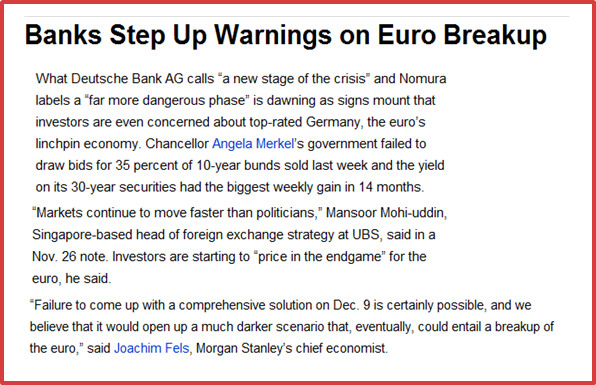 Alarm signals have been going off over the last week, not only due to the surge in the yields on Spanish and Italian debt but also due to evidence that the infection (contagion) is now spreading to what was previously considered to be the core (France, Austria) with the evident danger that more countries will lose their triple A rating. 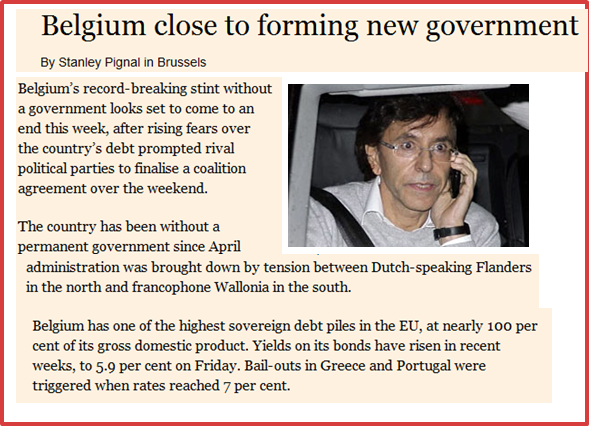 Should this materialise it will make some earlier strategies for financing Euro Area debt essentially non-viable. Thus the crisis is in grave danger of turning critical, with market attention increasingly focusing on the viability and the sustainability of the common currency itself. As President Barack Obama said recently the key question that now needs answering is who (or what) stands behind the Euro? 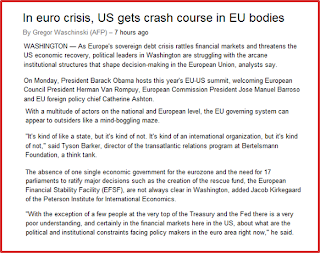 "Until we put in place a concrete plan and structure that sends a clear signal to the markets that Europe is standing behind the euro and will do what it takes, we are going to continue to see the kinds of market turmoil we saw," he told a news conference in Canberra last week. The key point to grasp is that we are talking about money here. What is the financial backstop which lies behind and guarantees the currency? This has put the spotlight on the ECB as an institution, but the bank is reluctant to adopt the role of ultimate guarantor. This is not principally due to the so called "inflation fear" - demand driven inflation is extremely unlikely in the Euro Area in the near term - but rather due to a fear of accumulating sizeable losses in the event that large quantities of bonds are purchased and then countries like Italy and Spain have to restructure their debt. The fear in Germany is that the German treasury could then be asked to shoulder the central bank recapitalisation. Hence there is a great reluctance to let this happen. Naturally some argue that a central bank can simply accept losses, since the bank doesn't necessarily need recapitalisation and could be allowed to carry on regardless of the red ink on the bottom line. 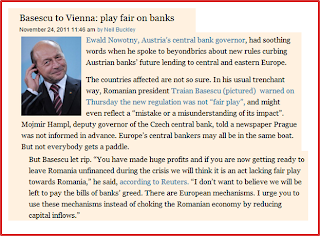 I am not very convinced by this argument, in part because banking and currencies are all about confidence, and it is not clear to me how the world would react to a headline like "European Central Bank Goes Bust". I think my fears are shared by the Bundesbank, and my intuition is that they are not at all keen to run the experiment just to see what actually happened. As Mario Draghi recently put it, “losing credibility can happen quickly – and history shows that regaining it has huge economic and social costs”. Hence we have a logjam, with the investor world asking for clarification about who stands behind the Euro, and no one stepping out from behind the curtain to say "I do". In addition there is a kind of "dialogue of the deaf" taking place between the investor community and Europe's political leaders, with the latter asserting that what we have is simply a liquidity crisis, while the former are not convinced, and often consider that what we are facing to be a solvency crisis. The lastest proposal to emerge - that the ECB lend to the IMF who then lends to countries like Spain and Italy - simply highlights the sum total of all these difficulties. 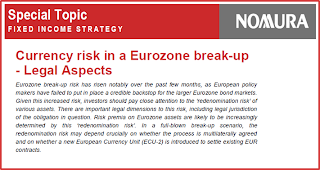 According to the argument as it is going the rounds, the ECB is not allowed, according to its charter, to purchase sovereign bonds in the required quantity, or to lend to the stability fund (the EFSF) for the same express purpose. But the EU normally has little difficulty finding its way round initial regulations and treaty clauses when needs must (wasn't there an opinion once that bailouts would be illegal? ), and in this case I am sure that if there were a will there would be a way. The problem is, as I am suggesting, there is no will for this solution from the German political leadership, due to the kind of losses which could be incurred. 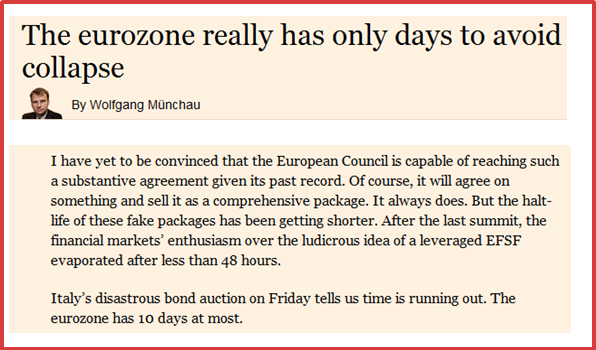 So the ECB asks the IMF to accept a loan and then lend on its behalf, but is this solution really credible? If a bank doesn't want to lend to a client due to concerns about the ability of the client to repay the loan, why should a neigbouring bank accept a loan from the first bank in order to lend to a client the latter does not want? What is involved here is a risk transfer, and it is not clear that non-European members of the IMF have any more stomach for accepting the losses which have been generated by 10 years of the Euro experiment than the core members of the Euro Area have. The UK posture in this regard is indicative - "you made the mess, now you clean it up". Of course, matters are not that simple. In the first place the global economy is experiencing a slowdown, a slowdown which is in part being fuelled by the decline in global risk sentiment associated with the European debt crisis. So everyone has an interest here in finding solutions. The rise in bond spreads in both France and Austria is associated with a similar process. 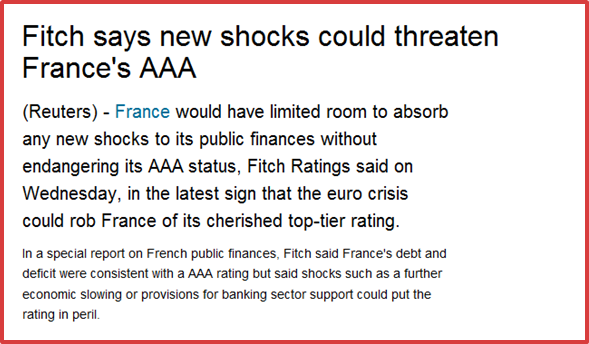 In the French case investors are worried about the sustainability of French debt should Italy be forced out of the Euro, or be forced to restructure. French banks have something like 400 billion euros in exposure to Italian debt (both public and private), and were anything bad to happen to Italy then something bad would also inevitably happen to France. Which illustrates another feature of the crisis, the interconnectedness - via debt chains - of all the Euro Area economies. In principle the French economy is sound. It doesn't have an irresponsible government spending problem, and it didn't have a housing boom. Certainly the French economy is in need of structural reforms, especially in the labour market area, but it is not a deeply sick economy in the way that most on the periphery are. 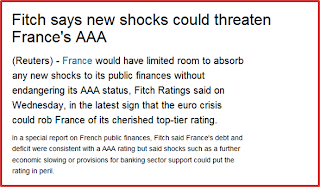 So the fact that French sovereign debt stability is now in question is a huge warning signal that things here could rapidly get out of hand. The Austrian case is similarly worrying. "Contagion" means what it says, that parts of the body economic which get infected risk passing the infection to previously healthy parts if the underlying issues are not treated rapidly. This is what is now happening, and the clearest example is in the East, where many economies are now slowing rapidly as a result of the crisis in the Euro Area. 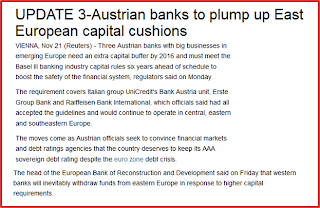 This is putting pressure on debt instruments in the region - and in particular in Hungary - and this increase in risk aversion is then feeding back into Austrian bond yields due to the Austrian bank exposure to the East of Europe. So basically we are all in this together, whether inside the Euro Area or out of it, here in Europe or in China or the United States. It is vital that some clear solution is found to the problem, and in particular that Europe make some rapid institutional changes which put real money on the table, and in sufficient quantity to calm the markets. Basically this means a common fiscal treasury in tandem with a much more interventionist ECB. Will this happen? At this stage in the game it seems unlikely, but then the alternative is the abysss, and peering directly into the abyss does have the strange property of concentrating people's minds, so you never know. Another possibility, which I have actively advocated, would be to divide the Eurozone in two, between a Northern core and the Southern periphery. This would be doable technically, and while being far from perfect would certainly go a long way towards easing the present stresses, but again, it would need clear, co-ordinated and determined action from the European leadership, and given everything we have seen so far there is little to suggest they will be able to rise to the challenge. 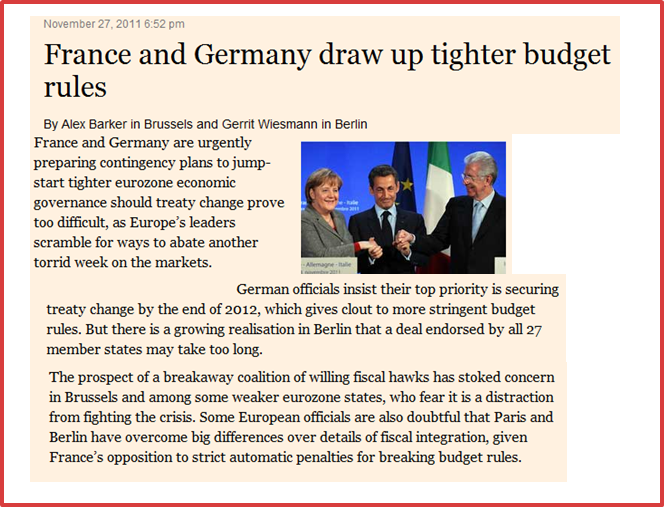 So we have the last "alternative" which is simply that markets push the issue to the limit, the centre does not hold (Germany, for example could be threatened with being stripped of its triple A), and the whole thing flies apart in the most disorderly and disaggreeable of fashions. If you were to ask me at this point which of the three above alternatives I considered most probable, I would have to say the latter, although naturally in no way do I wish this to happen, it is simply the risk that Europe's leaders are now taking. The worst part is that if involuntary Euro fragmentation did occur it could all happen very quickly indeed, as was the case with the initial attempt at EMU in 1992, although unfortunately this time round the consequences would be much more serious. Edward Hugh: Despite popular beliefs in Spain - where a great deal of importance and attention is focused on the political dimension of economic crises - the sad truth is very little. This reality is even evident in the last statements of Jose Luis Rodriguez Zapatero (who called for the ECB to act vigorously) and Economy Minister Elena Salgado (who stated bluntly that the problem was a European and not a Spain specific one) just before leaving office. The new government will be caught on the horns of a dilemma, since the 2011 fiscal deficit is widely expected to come in at over 7% of GDP as opposed to objective set in the Stability Programme of 6%. Mariano Rajoy can either try to dodge the bullet or accept the challenge that this situation presents. If he tries to dodge it - and according to one theory currently going the rounds the PP would like to pospone any deep cuts till after the Andalusian elections in the spring - then he will be dead on the starting block, despite being elected with the largest majority ever obtained by his party in the Spanish parliament. People who talk of trying to hold out till the spring are simply totally out of touch with the reality and the urgency of the present crisis. On the other hand, if he accepts the challenge, he could wind up a victim of market sentiment just the same. Basically Spain's economy barely recovered from the previous recession and is now entering a second one. House prices have not ceased falling, and unemployment has been rising uninteruptedly since the end of 2007. This situation is putting enormous strain on the financial system, with all parties effectively agreed that the Spanish financial sector needs a second restructuring. The problem is there is no funding available for this at the Spanish level, hence eyes had been looking towards the European Stability Fund (EFSF) for support in this sense. 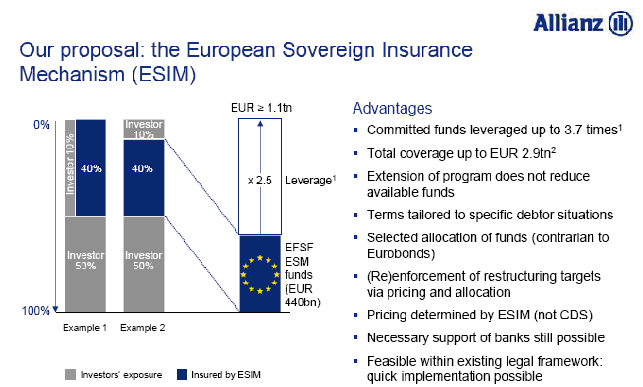 But in the current environment the EFSF is also struggling to finance itself, and herein lies the problem. The present situation is unsustainable, not only due to the high cost of funding Spanish debt, but due to the liquidity pressures that the falling value of Spanish government bonds is placing on the banking sector. The latter problem is much more important than the former in the short term, and indeed it was this pressure on bank liquidity (and not the sustainability of sovereign debt as such) that pushed first Ireland and then Portugal into a bailout. 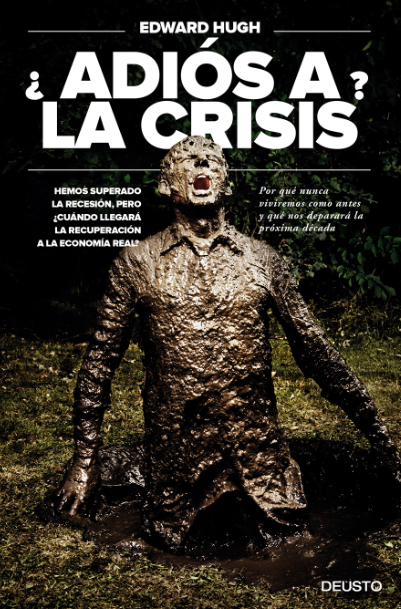 If we add to this problem that Spain's initial financial restructuring process is already leading to an acute credit squeeze which is basically strangling the real economy on the vine, then basically you have all the seeds of a truly full blown crisis. According to the latest EU Commission forecast, the Spanish deficit next year is expected to be 5.9% of GDP rather than the 4.2% objective set down in the EU stability programme. If Mariano Rajoy applies the kind of spending cuts which would be required to bring the deficit into line with targets in the context of an economic recession, then the probability is that Spain would have a rather severe economic contraction in 2012, similar to that which is currently occurring in Portugal. On this scenario the impact on unemployment would be severe (JP Morgan is already forecasting Spanish unemployment could rise to 27% in 2012), and the knock-on effect of this on non-performing loans in the banking sector correspondingly negative, and so on and so forth. So whichever way you look at it, Mr Rajoy is certainly facing a "heads I lose tails you win situation", with no easy solution. Which is why I say at the outset that the response has to come at the European level. The era of single country rescues has really come to and end with the arrival of Spain and Italy in the casualty unit. Both countries are of course, too big to save in the conventional sense, while at the same time if they both fail then the Euro in its present form is surely finished. In addition, the political dimension is much larger. Italy is not Greece, and Spain is not Ireland. It would be impossible to treat either country in the way which their smaller peers have been treated, and Europe's leaders are well aware of this. Barcelona International Network: What specific effects are future developments likely to have on Catalonia's relations with the rest of Spain? Given the substantial PP majority in the Spanish Parliament, do you see increasing political tension between a centralist nationalist government and a Catalan administration under increasing citizen pressure to exercise the right of self determination, or do you believe sufficient common ground will be found to make agreement and cooperation achievable to address the current economic issues? 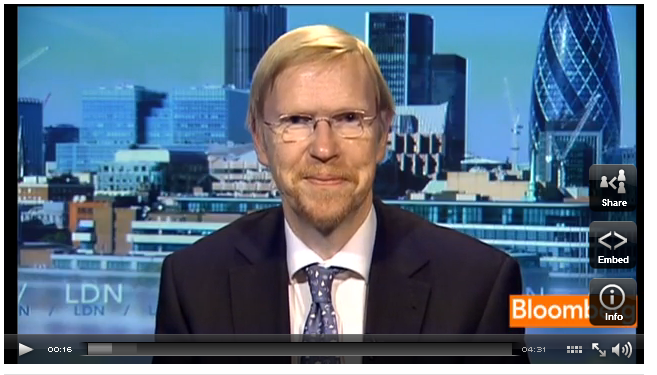 Edward Hugh: Well, as you probably know the situation here in Catalonia is very difficult. The cutbacks in public spending here have been very severe, more or less 10% across the board including in key areas like health and education. Yet despite this the underfunding of the region is so severe that the government is not going to be able to comply with the 1.3% of GDP deficit target laid down for 2011 by the central government. This year's deficit is likely to be around 2.6% of Catalan GDP but the government in Barcelona has made no secret of this, since it always considered the proposed reduction too drastic to carry out in one year. It is important to understand here that Catalonia has a large fiscal SURPLUS with the rest of Spain, maybe 8% of Catalan GDP. Catalonia is one of Spain's richest regions, and effectively subsidises spending in other parts of Spain. Most Catalans accept this, and accept that their region should make some contribution to balancing disequilibriums across the Spanish territory. What Catalan citizens cannot understand is the extent of their contribution, and why it is that their regions should be receiving swingeing health cuts while other areas seem to be able to avoid them whether by hook or by crook. So this is a very unstable situation. Catalans are also pretty fed up with the lamentable efforts of the previous Zapatero adminstration to find solutions to the economic crisis and to find ways of improving their financing problems - it is important to remember that Catalonia is one of the richest and most productive regions in Southern Europe, yet Catalan debt is treated scarcely better than Greek debt by the financial markets. We do not deserve this. My feeling is that the new Rajoy adminstration will go to some considerable lengths to try to avoid confrontation with the Catalan administration, and many Catalans will be ready and willing to respond to such overtures. 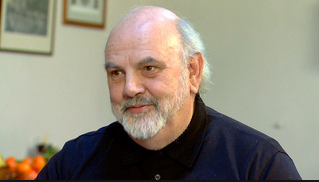 I well remember close Mariano Rajoy adviser Baudilio Tomé saying to me "Edward, you are one of those Catalans who recognises when Spain goes well, Catlonia goes well, and for Spain to go well, Catalonia has to go well". And yes I, like many others, take this view. The thing is, Spain isn't going well, and in the near future it is unlikely so to do. In addition the new government's room for manoeuvre may be very constrained. The Catalan Parliament is preparing a new financing proposal, but in the short term anything which improves Catalonia's situation is inevitably going to make the position in some other parts of Spain worse, so this is going to be an aspiration which it will be hard for a Spanish nationalist party to fulfil. So while in the short term there will be conciliation, in the longer run confrontation would seem to be far more likely, given the diametrically opposed aspirations of the various parties. Naturally, any kind of disorderly Euro disintegration would add to these strains enormously. I recently attended an experts meeting on the legal background to state creation. It was really fascinating stuff, but what I was most surprised to learn was that in the event of a Catalan declaration of independence, and absent an amical agreement between Spain and the new state, the liability for servicing existing debt issued by the Spanish state would fall on Spain and Spain alone. This would mean that the country without the Catalan financial contribution would be virtually immediately bankrupt. This is a daunting thought, and should serve to concentrate everyone's minds in the months and years to come. Catalonia could easily finance itself and live up to its responsibilities outside Spain. The same cannot be said of the parent country absent Catalan financing. I think it's high time for a change of mindset in Spain about this reality, and time that Catalonia's problems were treated with the respect and importance which they deserve.